Filed to: Jeb!Filed to: Jeb! GOP presidential candidate and sweater ascetic Jeb Bush’s emotional register on the campaign trail hovers between “mildly deflated” to “moderately chagrined”—but LOOK at how his eyes light up as he realizes that the expensive and impractical gadget he’s been wearing can make phone calls. Finally, a ! moment for our favorite dour Floridian scion! 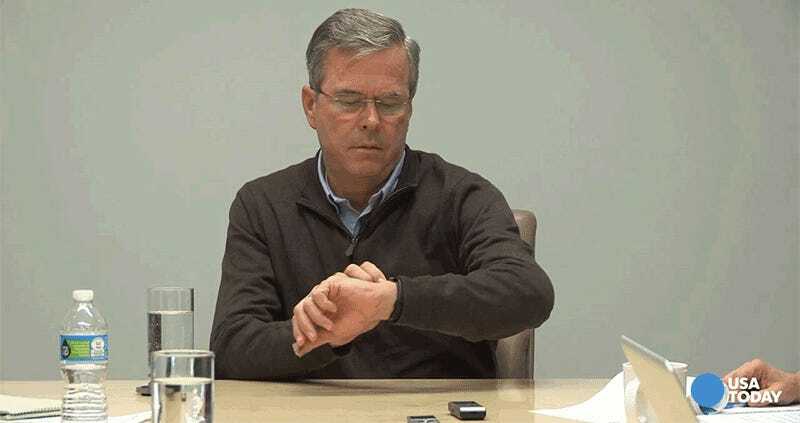 “My watch can’t be talking,” Bush said, as recognition that our merciless world can still contain a genuine surprise spreads across his face.